I have not posted here in a while. I have really not cooked much beyond the basics the past couple of weeks. It's just been that way. Some friends are visiting from Wisconsin and I am hosting a little get together for them. It will be like a mini tea thing. I get to make little sandwiches. And I am finally going to make that walnut-pear cake with sour cream sauce. Oh yeah, and I got some baby back ribs. I am going to do those up for Monday dinner. Which means I will set them to brine Sunday night. See you after the food-filled weekend! I'm giving you the money shot, right up front. No having to wait for it until the end this time. It was such a nice day Sunday that I decided to barbecue. I went to an old fallback, the pork tenderloin. I find it hard to screw up this cut of meat. And for a change I measured the ingredients for the marinade I like. Usually I wing it and it is always similar, but never exactly the same twice. 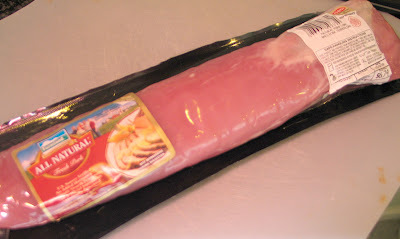 This is a fairly cheap cut of meat. The tenderloin I got was 1.35 pounds and cost about $6.75. It made dinner for me and the manfriend and enough left for him to take for lunch the next day. 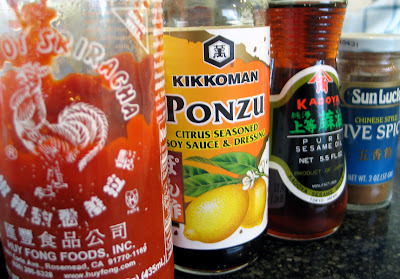 I get the ponzu sauce from the Asian food aisle at my market. I have found recipes online for how to make it myself, but the stuff in the bottle is easier. When I am out of ponzu (or if the store is out) I use soy sauce and lemon or lime juice instead (about equal parts). It is not exactly the same. But it works for me. Oh, and I use a gas grill. Whisk together first 5 ingredients ingredients. Transfer about 3/4 cup of the liquid to a small sauce pan and set aside. Trim any excess fat or silverskin from the meat. Put tenderloin in a dish or zip-top bag and pour marinade over it. 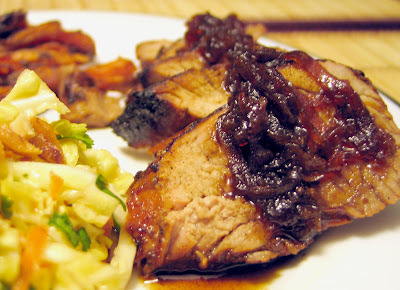 Let pork marinate at least an hour, turning meat every 15-20 minutes to evenly distribute flavors. The longer you marinate, the more intense the flavors will be. I would not marinate the tenderloin for more than 4 hours. This is a pretty strong flavor. Begin heating grill to medium-high heat. Heat the reserved liquid over medium heat and add wine. Slice the half onion as thin as possible and add to liquid. Keep cooking on medium heat until liquid reduces and you are left with almost a relish of the onions. If it starts to boil rapidly, turn heat down a bit. I should just be at a high simmer. There should be more onion that liquid and what liquid there is should be thick enough to coat a spoon. Once this is done, turn it off and set it aside to be used as a garnish for the tenderloin. 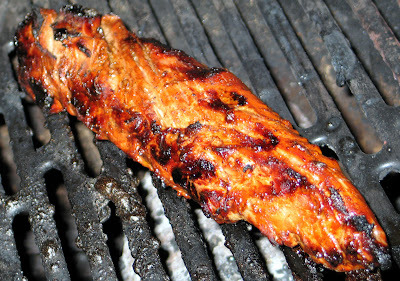 Place the tenderloins on the grill and cook for 18-20 minutes, turning a few times. An instant-read thermometer inserted into the thickest part will read 155 degrees F when the meat is ready. Remove from grill and let meat to rest for 5-10 minutes before carving. Slice meat into medallions and serve with a bit of the onion reduction on top or on the side. I served this with side dishes of sweet potato "fries" and a quick Asian slaw. Toss all the veggies together with enough of the salad dressing to make it how YOU like it. I like mine lightly dressed. Serve with a bit of the chopped peanuts sprinkled on top. But most things I try to grow do not do well. Probably because I tend to plant things and then just hope for the best. I don't do the work of looking after them and nurturing them. Flowers, herbs, veggies... They don't do well in my yard. Except that is for the lemons and rosemary. The lemon tree was already here when I moved in about 12 years ago. I think it was planted sometime in the 60s. It produces beautiful lemons all year long. They used to be too big and pulpy, with very little juice. But the past few years they have been perfect. No longer the size of grapefruit, they fit in the palm of my hand. They used to have thick, mealy skin which was barely good for making lemon zest. Now the skin is bright and yellow and slightly slick from lemon oil when I run the microplane over it. I use lemon a lot, so I love this tree. I do nothing to it. It just continues to bear fruit. 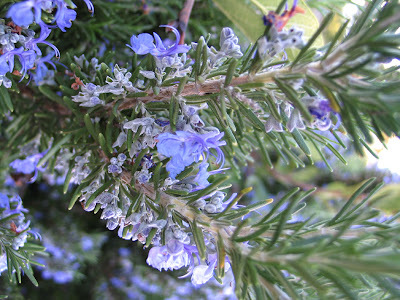 The rosemary I did plant. 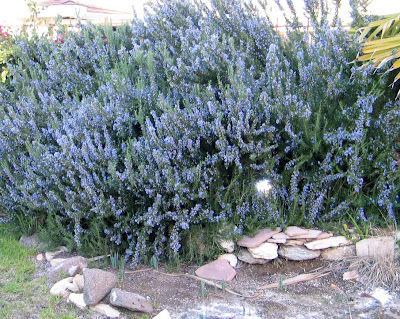 About 4 years ago I bought three, 1-gallon pots of rosemary and just stuck them in the back of the flower bed. They get tons of sun all day and pretty much just get water when it rains. Those three small rosemary pots eventually merged into a larger rosemary bush which has since turned into a giant rosemary monster that is the size of a VW bug. The pictures here were taken last week and you can just start to see the shoots of my daffodils popping up through the ground in front of the flower bed. The daffodils are now in full bloom, their full, bright yellow heads nodding in the breeze. They are such happy little flowers. I trim it the rosemary monster occasion, when it starts to grow taller than the block wall behind it and threatens to head into the neighbors' yard. It flowers much of the year. The delicate blossoms are a lovely purple-blue and attract passing bees. On a warm day just standing near it makes me think of roasted chicken and red potatoes with rosemary. It can be enough to make my mouth water. Sometimes I cut off a few sprigs and put them in a vase just to give the house that smell. I find it especially nice if it has been a while since I cooked a proper meal. It just makes the kitchen smell amazing. But it has been a while since I cooked anything with that rosemary. So that will be one of my things for the coming weekend. I have made lots of things with rosemary, including a polenta and rosemary cake served with strawberries and whipped cream. That was quite tasty. Maybe I need to make that again. 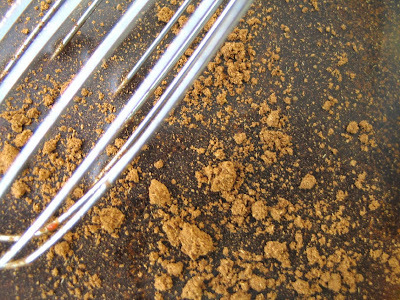 I remember really liking the dry, crumbly texture and the fact that it was not overly sweet. 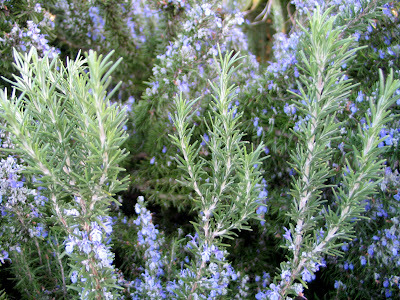 And I want to find a couple of new recipes using rosemary and do some experimenting. And I may throw in some of that lemon, too.